Add touch of glam to your holiday party manicure. It's that time of year again... holiday party overload! To make sure your nails are ready to go from party to party all weekend long, add a touch of glam with a Ruffian manicure. The Ruffian nail art design has been around for several years and it all started at New York Fashion Week at the Ruffian show. 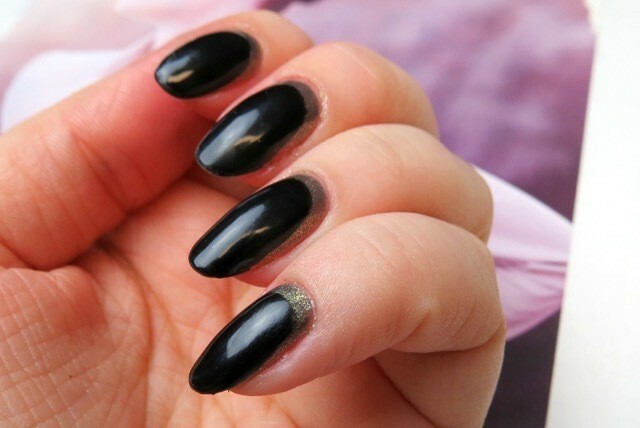 It features a peek of a second polish colour in a crescent shape at the base of the nail. You can use a French manicure sticker guide or do it freehand. The best Ruffian manicures feature complimentary colours or glitter polishes. To make yours look glam, glitter and sparkle are always the best bet. If you are using stickers to help you achieve this look, make sure to apply a fast drying top coat or let the first colour dry completely before applying the sticker. Once the sticker is applied along the base of the nail, apply the second colour to the nail and remove the sticker immediately after. If you want to try doing this freehand, start off with the first colour and then allow that to dry for a minute or two. Take the second colour and paint your nail like you normally would, but just starting a little bit higher than normal. Two coats of the second colour are probably needed to cover up the first colour. Allow to dry for several minutes, and then apply a top coat to make sure the design lasts as long as you need it to. Polishes Used: Revlon Rich and OPI My Gondola or Yours? Kaitlyn Delano is a beauty blogger based in Toronto. You can find all of her nail art designs on her blog, Kaitlyn Elisabeth Beauty, as well as makeup reviews and tutorials.